'Kanamo' is composed of two words that is Ka and Namo which means "a white lady". It is a 19,600 feet summit. This trek does not require any special trekking or maintaining skills but does require a good fitness level. 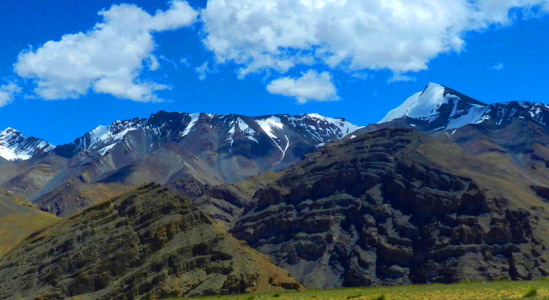 A good alternative trek for Stok Kangri & Friendship Peak trekking peaks. You get a spectacular view of Ladakh, Spiti, Pin Parvati Pass, Parang La and peaks of kinnaur side on the summit of this trek. Mixed ground of snow and boulder moraine or scree adds to another highlight of this trek. You will be staying in a geust house at Kaza. Accommodation on all other days will be in tents (2-3 per tent). Kanamo Peak trek is the most exotic destination that offers the unique blend of Himalaya’s beauty, and the beauty within, the whole journey of Kanamo peak is not just adventure sort of trek, but it makes one conquer themselves. It is the most outstanding trek that opens up the view of Kinnaur Lahaul Spiti valley, Kanamo Peak is nestled at an altitude of 19,553 Ft. While on the way to the Kanamo Peak trek, you will go through the small villages, the Glimpse of Spiti will be there on your way, the way you will go by will give the surprises in each vista. Kanamo peak is a marvelous trek amongst other, when it’s about trekking in Manali, as Manali has lots of destination for trekking and there is no doubt that each one is mesmerizing, the Himalayas are the boon for India; therefore trekking in India is well- Known around the world. Where Kanamo Peak Trek in Himachal takes you through the Gigantic Mountains and the spectacular view throughout the way will not keep you calm at all; instead, each vista towards Kanamo Peak Trek will excite you to reach the destination. The fountains that flow downwards and merge with streams throughout the way and the snow-capped mountains, along with the landscape in the whole journey will be beyond one’s imagination. There are other highlights of Kanamo peak that goes like; the small village Kaza, from where the path heads towards more great destinations. The whole journey will be pleasing; no doubt it will be a little hard amongst others, as Trekking in Himachal is astonishing so as the Kanamo Peak Trek. The whole kanamo peak trek package is 12,250/- INR only, and the best time for Kanamo peak is from May to August. One who has an experience of trekking can do it quite easily, but it will be a hard trek for the beginners as the pathway has steeps. the patches with boulder can create a hurdle for beginners to trek towards Kanamo peak, and it will become a tiring trek, people with a decent fitness can trek to Kanamo Peak. Kanamo Peak Trek could be the most magnificent and incredible journey for the trekkers amongst all the Manali Trekking destinations, but again the difficulty is still there as the pathway will not be very accessible for the beginners to walk, and higher altitude climb can make it an arduous trek for the trekkers. Is it suitable for children’s? No, the trek is not favorable for children’s, as the difficulty level is higher than average. Is it a good option for the first time trekkers /or families? Somehow, this Himalayan trek is graded as the moderate trek so it is not a wise choice to take the family to this trek though first-timers can go just in case they have the ability to not giving up, and maintain a decent fitness also, as the Kanamo Peak Trek has tricky patches, and a well-planned kanamo peak itinerary will make it less tiring for the trekkers. The altitude of Kanamo Peak Trek is 19,553 Ft. one can attain the maximum altitude depends on the subject to his endurance and other conditions such as a climate, temperature, The trek will open up the Kinnaur Lahaul Spiti valley view, and on the higher altitude, everything will look so mesmerizing. The things that one has to keep in mind is to take a proper medication with them at the higher altitude, though we provide every possible thing it is always better to keep your medicine according to your health, Hydration is the most important when you will trek to the higher altitude, so keep your body hydrated while trekking. The best season for Kanamo Peak Trek is from May to August; a trek to this admirable destination can be planned between these months as the destination glows the most, whereas in winters this resplendent destination is always wrapped into the blanket of snow. The Destination offers the splendid view; the landscape is beyond imagination, the gigantic mountains wrapped with snow looks mesmerizing. Enriched by the glory of nature Trekking in Himachal can be the best experience in all seasons, where this trekking destination Kanamo Peak is no doubt a delightful one. During the daytime temperatures will range from 16-20 degree Celsius and night time temperature can go down to -4 degree Celsius in July. One should bring enough pair of clothes and better quality trekking boots (Link of Blog) so that a trekker can be covered thoroughly and does not face any difficulty during the stay at this temperature. 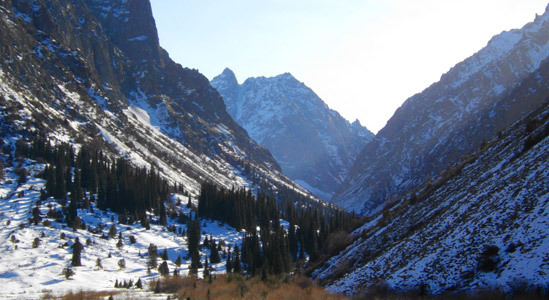 There is a vast difference in the mountain temperature, and when it about the trek to Kanamo Peak, so it might be possible that one can encounter a little difficulty during acclimatization. It is essential to bring all warm clothes, and that may not even affect the backpack too much. What makes this trek different? Kanamo Peak is settled at an elevation of 19,553 Ft. Kanamo Peak trek is the most fantastic trek that offers the unusual mix of Himalaya's magnificence and the excellence inside, the entire voyage of Kanamo top doesn't simply experience kind of trek, it makes one vanquish themselves. Kanamo crest is a sublime trek among others when it's tied in with trekking in Manali, as Manali has bunches of goal for trekking and there is no uncertainty that everyone is thoroughly entrancing, the Himalayas are the shelter for India, like this trekking in India in the most popular. The most exotic trek that opens up the perspective on Kinnaur Lahaul Spiti valley, while in transit to the Kanamo Peak trek, you will experience the little towns, the Glimpse of Spiti will be there on your way, and how you will pass by will give the amazement in every vista. Where Kanamo Peak Trek in Himachal takes you through the massive mountains and the breathtaking view all through the way won't keep you quiet by any stretch of the imagination; instead every vista towards Kanamo Peak Trek will energize you to achieve the goal. The wellsprings that stream downwards and converge with streams all through the way and the snow applauded mountains, alongside the scene in the entire voyage will be treated the eyes of each trekker with the natural gifts. Small villages and the cultural practices of the natives. Border landscapes, panoramic view of the mountains. The Journey of Kanamo peak will start from the Manali, as Manali trekking is well known; it includes lots of treks in its list. So the trek will begin from Manali, and the drive from Manali will be held earlier as it will take a little longer to reach Kaza it is 201Km away. The conditions of the route as in the mountains it takes more than it seems to reach the destination, and in between the whole journey, you will take halts at least two times. The route will pass by Rohtang where beholding the beauty of greens, and the mountains will treat your eyes well, after Rohtang pass, the drive will be heading to Gramphu. A mini town Gramphu that will showcase its beauty to you in a magical way, and later Batal, after crossing Batal the vistas of Spiti valley will open up in front of you. The very next day you will start your journey of Kanamo Peak Trek from Kaza towards Kibber, the trip to this mesmerizing trek will not let you keep calm as each step you will take will show you something unique, the whole journey will be a fantastic experience for life. The starting point towards a beautiful journey has been started, so the 2nd day from Kaza village you will move to Kimber where in between you will pass by ki. Where you will witness the Ki monastery that is the biggest monastery of Spiti Valley, and the religious training center for the Lamas, all the way from Ki we will head towards Kimber. Wherein between you will pass by a tricky path, but the view along the way will turn your mood on for the upcoming adventure that is still folded, Kanamo Peak Trek will be the most memorable trek for any of the trekker in their journey of Himachal Trekking. The cold breeze throughout the way will touch your face and show you it’s the power of mother nature, in between the journey you will take the halt so that you can gain up all your energy as it the trip will be little long in the tricky areas. You also will be able to witness the Himalayan ibex on your way, and the whole areas have a narrow road that you have to cross, the scenario of the area is so engaging that it won’t let you distract yourself from admiring the beauty of it. 4th day will be a trekking day, so it would be better to take a proper sleep the 3rd day, and the trek will start by 4th day from Kibber to Kanamo Base Camp, that would be Moderate trek but with little tricky patches, and bends. The area is loaded with the dry grasses, and deserts that somehow will give you a challenging long day trek, while you will start the trek from Kibber, it would be an adventure as well as the exciting journey, the desert. The border landscape will seem so surprising, and the trip will let you know that in the world of wonders a human is a small creature only. Therefore you can understand the beauty of the Himalayas and the beauty of Manali Trekking destinations as Kanamo Peak trek itself. A slow descent will later follow the total ascent for the first 3 hours on a whole 6 to 7 hours trek; The entire trail will go through the small villages where witnessing the native culture will be exotic. It would be the best location for the photographers to capture the beautiful pictures, along with that the flourishing harvest fields and mountains lakes will look like beautiful scenery. The whole route is covered with beautiful flowers, and the Brahma Kamal that sets four moons in the destination, and the entire mountain range that will look so mesmerizing with the sky that will seem so near to you, where you will see yourself, somewhere in the paradise. The 5th day when the sun will rise and the sky will change its color, the adventure that will remain the same for life will come to your way, the strong winter feel will be there, and the demon of cold can go inside. So it would really be better to layer yourself properly, so 5th day will be the one when you will really do the real adventure in the lap of Himalayas, you will wake up and have your breakfast, you will start your trek, and later on you will find the magnificent vistas of snow-capped mountains, and the landscapes. The whole trek towards summit will be the blend of steep ascent, and relaxing flat walk on the other side, later in the rise of 7 hours you will feel tired and so the halt will be taken wherever you will feel comfortable as it would be little challenging way. On the tricky pathways, it would be better to step up wisely, and it is essential to take careful steps and avoid falling; therefore, it would be better to listen to the trek guide in the whole journey. The whole journey from the Kanamo Base Camp to Kamano Peak Trek will be spine-tingling, along with that it would also hard because of tricky patches, boulders, and rough path but eventually the view will be so mesmerizing that will blow your mind the whole Kinnaur-Lahaul-Spiti valley in front of you will be so admirable, from the Kanamo Peak you will also witness the renowned passes as Parang La and Pin Parvati, and in the back side of Kanamo Peak you will witness the splendid vista of massive glacier. Later on, the descent from the Kanamo Peak towards Kanamo Base Camp will be easy to moderate and take approx 5 hours. On the 6th day, you will drive back to Kaza from Kanamo Base Camp; initially, there will be trekking from Kanamo Base Camp to Kibber, you will capture every memory in your heart and take it back with you. the whole journey of Kanamo Peak Trek will make you remember it for life, as it is not the normal trek, though each destination in Himachal trekking cannot allow a person to forget the experience, after reaching Kibber you will drive back to Kaza. The path is full of beautiful brilliance with a fascinating backdrop of the mountains left behind. The adventure towards Manali will begin from Kaza; The arrival venture is very nostalgic as you drive through familiar places landscape. On the off chance that you are investing more energy in Spiti previously or after the trek (all alone), go over the Spiti stream. There are lovely towns like Rangrik, with a gigantic Buddha statue on a mountain, Pagmo and so on come into view. You can likewise visit Hikkim, which has the world's most noteworthy post office. Somewhere else to visit is the Key religious community, one of the large sanctuaries in this area. In transit, you will see the perfect town of Chicham, which is associated with the street by a pulley-worked trolley. And this will be the last day in the lap of Himalayas and as you will return with a lot of memory, remember to keep this for life, and you will not be in doubt that this Himachal trekking journey will always be close to your heart. Kanamo Peak trek is only the ideal trek for you to do this time. Move for the trek to the Mt Kanamo Peak! Short in nature, it is one of the perfect treks of 19,553 Ft. encounter to trekking in India. The Kanamo Peak trek trail opens up much magnificence of the mighty Himalayas. Adding to the whole experience is the trekking background to mesmeric Chandratal and outdoors by the water body. You will clear your path through Spiti Valley, going by old world enchanted religious communities and strolling through large villages. The individuals who are intrigued can take part in boating in Spiti River. At first, amid the trekking action, you will be driven from Manali through Rohtang Pass and Lahaul Valley before touching base at Batal. At that point, you appreciate the trek to Chandratal, a high elevation cold lake. It is named so given the half-moon shape and is ringed with mountains and many shepherd camps making for a perfect sight. Even though non-specialized, the ascension requires you to put in endeavors. In the first step you will get it that every trekking in Manali is the most magnificent one, in the lap of the Himalayas the pride of Mother Nature can be witnessed beautifully, the sky that feels so near, and the gigantic mountains that looks so mesmerizing, the pathway are tricky but then that is what adventure is all about . The lakes and the small stream throughout way will be so amazing, and the flow of the crystal clear water will make your heart glow beautifully. In this journey of Kanamo Peak, you will forget the hustle bustle of the city and will get lost into the overwhelming beauty of Mother Nature. The gigantic mountains will feel like a scenario in video games that everybody has played in the childhood, this whole trek that starts from Manali will let you know that how glowing, and a diamond-like trek it is. Compensating you are the unusual perspectives on faraway Kullu, Kinnaur, and Ladakh. Get an opportunity to absorb the astounding magnificence of the place as you proceed with your trek. When you achieve the summit, you will get a 360-degree perspective which is exceptionally captivating. Make your get-away unique as you head out for this one a benevolent energizing trek to the Himalayas. Known as the white woman top, this trek is considered as a troublesome trek by some as you have to get acclimatized to the climate. Amid your trek, you will run over some dangerous way as you approach the summit from South East side of the edge. You will begin this energizing trek from Manali and travel to Kaza, as you take the trek you will get seeing verdant Kullu and Manali valleys along the barren landscape of Lahaul and Spiti valley through Rohtang Pass. 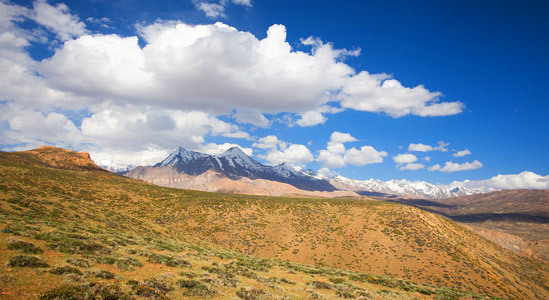 On your second day, you will begin trekking from Kaza to Kibber. You will trek for around 6 hours to the captivating destination. As you proceed, you will discover numerous shepherds around and after that appreciate extraordinary sights of Himalayan summits. On your third day, you will acclimatize yourself in Kibber. On your fourth day, you will begin your trek from Kibber to Kanamo Base Camp, and on the fifth day you will be head towards Kanamo Base Camp to Kanamo Peak, A climbing trek will trail your trek to the edge that will take you to the top. As you gradually proceed with you will go over the incredible sights that incorporate Parang La Pass which prompts Ladakh, Pin Parvati Pass which to Kullu Valley, Kinnaur extents, Lahaul and Spiti and the shocking valleys. On your 6th day, you will begin trekking from Kanamo Base Camp to Kibber which will take around 4 hours and after that from Kibber to Kaza. You can likewise enjoy boating at the Spiti River. On your seventh day, you will begin from Kaza and after that back to Manali. This trek to Kanamo Peak is unquestionably the best trek for you. That is the essence of trekking in India, along with that trekking in Manali; this will be the best trek for you in your whole journey. Trek Essentials to Carry with Yourself. Trekveda, by dint of its team of trained professionals, leave no stone unturned to provide you with the best trekking experience while ensuring your safety as its priority. 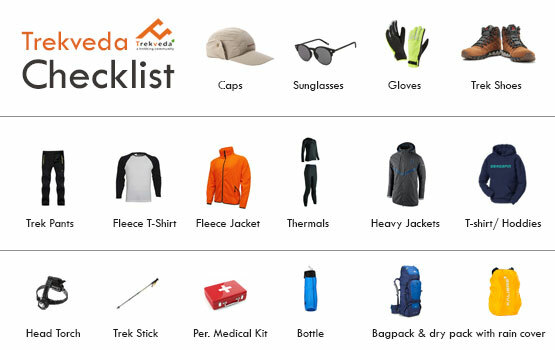 Here are some vital aspects that Trekveda includes in its checklist to ensure the safety of its trekkers. Trekking at high altitudes demands endurance and fitness and those who are prone to any kind of physical or physiological ailments are advised to not to go for high altitude treks in the beginning. To get assurance about the trekker’s fitness, we comply with certain aspects of the being fit such as BMI (Body Mass Index) along with the fitness proof since we can’t put the trekkers into the risk. Acclimatization is another important aspect when it comes to getting an adaptation to the climate at the high range treks. A day at rest is not just the rest but a chance to get used to of the place and its habitat. Monitoring the health is one thing that is conducted regularly during the trek by the trek leaders which includes the monitoring of your blood pressure, oxygen level and pulse rate. Details of your health during the trek is maintained in the health card on the regular basis. Health card can be collected from the trek leader at the end of the trek. Trekveda provide you all the necessary equipment for trekking from tents to ropes. In addition to that, our trek leaders also ensure the safety by various safeguards they take time to time for your safety. Micro spikes are provided to attach to your shoes which help you to keep the traction on the snow and make it easier to climb. An additional gaiters are provided to cover the shows which prevent the entering of snow into the shoes. Customized tents are provided to the trekkers which ensure the warmth and temperature 10 degrees higher than the outside coupled up with high quality sleeping bags which can endure the temperature up to 15 degree Celsius below the freezing point. Trekveda, keep all your nutritional and hydration requirements on its checklist, our trek leaders will guide you to keep your body hydrated on the high altitudes as de-hydration can attract to the severe medical emergencies on high altitude treks. We provide the highly nutritious meal to energize your body for the trek, however before certain long trails we ensure your nutritional requirements to be fulfilled with some high energy snacks or packaged lunch. Make sure you keep up with your hydration and nutritional part as this can lead to some fatal consequences for your health. In case of any symptoms you feel during the trek, don’t ignore or avoid them, immediately tell the trek leader. Keeping up with the pre-defined processes and the guidelines will help you to have a memorable trekking experience. What Trekveda has to offer in case of medical emergency like AMS, HAPE or HACE? In case of medical emergencies, Trekveda and its trek leaders bear the sole responsibility to get you back to your wellbeing with their training and techniques. Suspecting any physiological disturbance in your body, immediately report to your trek leader as they are trained to counter such problems. Problems like Acute Mountain Sickness can be prove fatal if not taken into consideration seriously on time. If you encounter/experience any of the symptoms such as persistent headache, fatigue or weakness, nausea, dizziness, loss of appetite, difficulty in sleeping, you shouldn’t let it go or treat it by your own either. Acute mountain sickness is one of the most common yet the fatal problem trekkers face due to number of reasons, if the problem continues to persist, then you’re advised to descend down to the basecamp and then to visit the doctor immediately. People with AMS are treated with number of medicines such Diamox, Nifidipine etc. coupled up with methods like Triple One Test- where one disprin is given with a liter of water along with the rest for an hour. While AMS is most common at the high altitudes yet it can’t be risked taken casually as it leads to severe fatal conditions like HAPE (High Altitude Pulmonary Edema) or HACE (High Altitude Cerebral Edema) which, if not treated on time can lead to number of serious chronic disorders. These conditions need to not to comply with AMS, they can occur without AMS preceding. It’s suggested to take every single disturbance into the consideration while you’re on the trek. However, Trekveda is capable of tackling all the medical emergencies with its trained professionals yet there are several things that you need to consider, specially the intake of medicines and the knowledge about their advantages and side-effects. Don’t administer the medicine if you’re trekking through an organization, always seek help from the trek leaders, they are trained for such purposes, while in case of being a solo trekker, you should know about the medicines. Keeping yourself hydrated and nutritionally fulfilled curbs the chances of AMS. A high altitude trek requires an audacious state of mind, however leaving on a bold excursion without computing the dangers is absolute idiocy. That is the reason we have recorded a couple of Risk and the Response arranged by Trekveda to limit or address the dangers in the most ideal way. Before you begin the trek, it is critical to comprehend the ramifications of high altitude on your body. Know about side effects of AMS (Acute Mountain Sickness) like mellow cerebral pain, queasiness and general distress. Response: If you feel any of these indications, illuminate the trek pioneer on need and take after his directions. Each campground has as stretcher, completely prepared medical aid pack, oxygen chambers to address the circumstance. Weather is unusual in the Himalayas. Despite the fact that we are constantly attentive about the evolving climate, nobody can ensure a snowfall, rain or Sun. Do comprehend that your security is of most extreme significance to us and we won't continue any further from the campground if the climate isn't ideal. Response: The choice of the Trek Leaders and Guides to continue or sit tight for the climate to show signs of improvement will be last. Often, while trekking over troublesome territories, you may have minor wounds like leg sprain, wounds and so forth. Genuine wounds like breaks or real cuts are exceptionally uncommon. Response: All our Trek Leaders are Certified Wilderness First Aid responders. They are prepared to deal with crises and can handle minor wounds with an all-around prepared medical aid unit. If there should arise an occurrence of genuine wounds, the patient is carried on a stretcher to the closest street head and is directed to closest therapeutic focus. In the remote zones of the Himalayas, portable systems don't reach. On a trek, one is cut off from the universe of calls, SMS or WhatsApp Messages. Response: We’d depend on walkie-talkies and sprinters to communicate between the campgrounds and the base camps. Trekking, for its ever-lasting memories and experience, demands just a few things which involve physical endurance with physiological wellness. Not just the one who’s physically fit would do the magic in trekking but one also needs to be mentally fit as well in order to cope up with the adversities one might have to face during the treks such natural calamities, rains or other unforeseen conditions. To keep up with such requirements of trekking here are a few things you can do to get yourself physically fit. Cardiovascular endurance is the primordial thing that this trek asks for along with the stamina to withstand the stringent conditions during the trek. There are number of ways you can increase your endurance level but Jogging regularly with gradual increase in the pace would do the magic in just 2 or 2 and a half months. You can also increase your endurance and stamina through swimming, cycling and much more. To build the strength is another most important thing and a major requirement for this trek. The whole journey of the trek is like an eternal staircase, the more you climb the better you can have the view. It goes with a climb followed by a flat then again, a climb followed by a flat. All the scenic beauty of the trek demands no less than the power of your legs. The strength of your legs is something you need to work upon. Here is what you can do to strengthen your leg muscles to bear the pain of the trek. Doing the squats can help. Goal for 3 sets of 15 repetitions without fail. You can begin with 8 squats in each set at the beginning, subject to your core strength for the exercise. The more flexible you are the more you have the chances to get the glimpse with lesser hustle. Stretching is another major aspect of the trekking which provides you the much-needed flexibility to climb the altitudes with ease while carrying the backpack altogether is not an easier errand. Stretching your body at large can bring you the utmost comfort during the trek. Here are some stretching you can do to get the flexibility-Stretch your hamstring, quadriceps, hip flexors, lower back muscles and shoulders. They’ll give strength and help you arrive on the slopes with the relaxed muscles. All these exercises would help you to get through the trek with ease and comfort provided you give an ample time to these. Cardiovascular exercise is one of the most sought-after method which provide not just the physical endurance but also the strength to withstand any unavoidable circumstances sternly. Trekking demands the high endurance which you can develop in a month or two where you need to begin with the jogging or running (only if you could do). This practice needs to be combined with the speed and distance targets. You need to keep on increasing both with the time. Begin with a target of completing a distance of 5km. in 45 minutes and then gradually increase it to 7 km. in the same time and remain stick to this practice until you are able to cover 10 km. in 80-90 minutes without fail, at a stretch. Another vital area of improvement, you need to work upon. Before you head to the trek, you need to have the physical strength in order to carry backpacks on the uneven terrains. Considering everything under the sun, you ought to prepare yourself for the core strength. A strength would be make you suffer less than others who’d not pay the heed. Flexibility in the body is what the trekking demands the most. Carrying the backpacks without flexibility in your hamstrings, quadriceps, shoulder, lateral sides etc. can prove out to be fatal. More the muscles relaxed, easier would be your trekking experience. Carrying a backpack, however light in weight, can bring you the unnecessary pain which may spoil your entire trek. To pacify yourself or any other companion, yoga and meditation are the key. These practices not only give you the mental peace but also provide you with a placid inner conscience which is extremely important in order to withstand the cons during the trek. This also improves your decision-making ability in the direst stressful situations, during the trek. The trek expense of Rs. 12,250 + 5% GST takes care of all expenses of the trek from Kaza to Kaza. Accommodation – Stay is included from Day 1 to the last day of the trek. You will be staying in the guest houses of the respective locations & camping on remaining days of the trek. Meals – All meals from dinner on Day 1 to breakfast till last day of the trek are included. We provide simple, nutritious vegetarian food on all days of the trek. Trekking Equipment – You will stay in high quality tents and sleeping bags in all the camps. Our high-altitude sleeping bags can withstand temperatures as low as -10 ºC. We provide ice axes, roped, micro spikes, gaiters etc. as required. Services of an expert Trek Team – The mountain staff on this trek consists of well-trained guides, cooks, helpers and porters. Transport to and from the base camp – Trekveda will offer the taxi services from and to the base camp. Food during transit to and from the base camp – The trek fee does not include meals purchased during the journey to and from the basecamp. Backpack offloading charges - If you wish to offload your backpack, there will be an additional charge of Rs. 2,100 + 5% GST. The backpack cannot weigh more than 9 kgs. Suitcases/strollers/duffel bags will not be allowed. Please note that charges will vary for last minute offloading in case you decide to offload your bag after reaching the basecamp (Rs. 2,400 + 5% GST). Online offloading in advance is possible up to two days prior to the trek start date. Stay at hill station on the last day. Buffer day – It is mandatory to have this extra day as any bad weather or rain will delay your pass crossing. If buffer day is utilized, you will need to pay Rs. 2,450 + 5% GST. This amount is to be handed over to your trek leader. Cancellation: In case of trek cancellation due to any natural hazard or any other reason (like rain, strike etc.) Trekveda will undertake the whole responsibility of the amount as per its refund policy. Trekveda will provide its clients with a voucher which can be redeemed for any trek in the next one year. Or if you wish to call off the trek voluntarily at the last moment, in this case only the mail requests at cancel@trekveda.com or contact at +91 7078701964 will be entertained. Prior cancellation 40 days from the start of the trek is 90% refundable. Cancellation between 40 to 20 days from the start of the trek is 45% refundable. Cancellation between 20 to 10 days from the start of the trek is 10% refundable. Cancellation within 10 days from the start of the trek is non-refundable. Please Note: In case of refund, there will be a deduction of 4% (bank charges) from the total fee you have paid. Also, if you have opted for a trek insurance, the amount will not be refunded. In the process of refunding the amount, it may take 15 working days to credit on your bank account. In case of transferring a trek to a friend, he/she should satisfy all the mandatory requirements put forward by Trekveda. Trekveda holds the right to change/cancel the policies, without prior notice. The cancellation policy will be same whether you are cancelling your trek just after booking the trek. The trek fee includes all costs of the trek from the start at the base camp to the end. Emergency during trek: In case of medical emergency, the trekker will be taken care at the primary stage since we don’t accompany the doctors during the trek, however our trek leaders are trained for the first-aid treatment. Post the first-aid Trekveda will take the liability to send down the trekker to the nearest basecamp or road head. Fitness: Before you head to plan a Chadar trek, your body fitness needs to be maintained for the high-altitude Himalayan treks since level of oxygen is considerably low at high ranges, thus proper cardiovascular training is a vital component of pre-trek preparation. Non-liability: Trekveda is not responsible for any loss/damage of your gears/equipment or other belongings on the trek. Payment: Payment for the trek can be done online through credit/debit card or net banking. Cheque/draft or cash is not accepted. Drinking and Smoking during the trek is strictly prohibited. If found flouting the rules, your participation on the trek will be cancelled with immediate effect. Will you provide us with tents and sleeping bags? We give 4 seasons tents by Gipfel for higher altitudes which can without much of a stretch withstand substantial snowfall and tempests. They are sufficiently extensive to accommodate 3 individuals on the double with a vestibule to put the knapsacks. Our resting packs are comprised of Heat seeker Pro manufactured protection that can give you comfort in - 10 degrees Celsius. We likewise utilize extra wool liners to have warm effectiveness even in the extraordinary temperatures of - 17 degrees Celsius. In the event that you convey your own resting sack, you will get a cashback compensate gave that you educate us when you have booked your trek. Bring Poncho (Rain cover) for your backpack and your own. It will protect your belongings from getting damped. In case if you get drenched due to any reason, it’s advised to put off your wet clothes as early as possible because keeping yourself wet at high altitudes can attract unwanted medical complications which may cost you fatal. Will backpacks, raincoats and other equipment be available for rent? No, these are not available for the rent. You need to carry or purchase them before you head for the trekking. Raincoats and backpacks are a few of the most important things you’d need during the trek provided you are trekking in the rainy seasons. Can I take my child along on this trek? What is the age limit? Yes, but it solely depends up on the difficulty level of the trek, for some treks the age limit is below 10.
Who will be with us on the trek from Trekveda? Certified and experience trek leader, assistant trek leader, Certified guides, High altitude porter, Co-guide, cook, Assistant cook, mules, mule’s men. What kind of food is served on the trek? Should we carry any food? We provide highly nutritious food during the trek in order to keep you away from gastro-intestinal problems. No, it’s generally not advised to carry your own food during the trek. Why is the trekking pole necessary? Trekking pole is one of the key component as well as companion during the trek when you’re ascending towards submit. It helps you in balancing through the sloppy treks and slippery streams. Carrying a trekking pole may sound irritating but it’s of major use at the high altitudes. When it gets really cold can I consume alcohol? No, Alcohol and smoking is strictly prohibited during the trek under any circumstances. Dizziness and other issues may arise due to alcohol, which may attract number of fatal outcomes that would not be good for your health and would hinder the trek experience as well. How do I manage the negative temperatures on the trek? Do I need special jackets? You need to do at least 3 layers. Wearing fleece with a warmer along with the jacket would do the needful to protect you from the cold. Is it safe to trek with Trekveda? Yes, we ensure safety of trekker by providing require medicine and regular health checkup. In addition to this, our trek leaders are the trained professionals which are made to defy all the odds during the trek. Moreover, we ensure the trekkers at the first point via numerous physical and physiological endurance test. Can I leave traveling clothes in basecamp behind and collect them after the trek? Yes, you can but we shall not liable be for any of your costly equipment. However, carrying your belongings along with you sounds wiser as you don’t know what demand may arise during the trek and if you don’t want to drag the additional weight while trekking you may opt either of the one. You can opt for offloading which will be charged accordingly. How many people are there in one group? A batch or group generally consists of 15-18 people. However, there might be the change in numbers as per the availability and due to other reasons. Is there an option to offload my backpack? If you want to offload your rucksack, you will have to make a request for offloading a few days prior the trek through an email so that arrangement can be made in advance. You will be charged per day for offloading your rucksack. In case you decide to offload on the spot, you may have to pay a higher price than usual. However offloading your rucksack is not recommended since it is not a safe practice. We provide 6 meals a day. Breakfast, Lunch, dinner, Brunch, evening snacks and supper. The meals will be nutritious in nature and would give you energy for the trek. What is the Starting and ending point of trek? Your basecamp will be your starting point and ending point can be different. You will get this details while booking of every treks respectively. Do I have to bring any trekking gear? Trekking Shoes (If don’t have any then bring sports shoes with good grip and have to be water proof), trekking poles, water bottle, sun glasses, poncho, poncho for back packs, Tiffin (Don’t use silver foil). What is the wellspring of drinking water? Is it safe to drink? Water source is natural streams, rivers and water springs in the mountains and it is protected to drink. Yes, trekking pole is necessary for high altitude treks. Trekking poles provide an additional edge while climbing and support you as an aided limb. Are trekking shoes necessary? Would I be able to utilize floaters to trek? Trekking Shoes will be best choice, if you don’t have any then bring sports shoes with good grip and water proof. Floaters are not advised to use during the trek because of their slippery soles. What number of individuals will share a tent? A tent will be shared among the maximum of three people, however a number may vary as per demand or the availability of the treks. Is accommodation for men and women different? Yes, keeping the privacy as the priority we keep the accommodation for both genders segregated. Special cases may be taken into the consideration. Would we be able to expect rain during the trek? Sudden showers are normal, bring a light rain coat or poncho. This will help you to keep you and your belongings dry which is most important at the higher altitudes. What sort of nourishment do you give? We provide you with the vegetarian food that’s full of nutrition that would fulfil all your energy requirements during the trek. We avoid serving junk during the trek as it may lead to gastro-intestinal issues in the trekkers. Do I have to convey any documents with me? Is there a doctor going with us on the trek? No, But certified trek leader will look after your health. Our trek leaders are professionally trained to fight against any medical complications at the primary level. In case of emergency, Trekveda takes liability to descend the trekker to the nearby hospital, basecamp or the road ahead. Do you provide toilets in the tent? Yes, a separate tent will work as toilet. However you’re advised to maintain the hygiene by using the biodegradable disposable toiletries and keeping the sanitary napkins and other stuffs in separate zipped bags. Is there any arrangements for bathing? No, due to number of unavoidable circumstances we tend not to make arrangements for bathing at the higher altitudes. Do we get mobile network on the trek? It depends on the trek location and your network providers. However at some treks, it possible to connect to the people while others are left abandoned by the telecom companies. Are smoking and drinking allowed on the trek? No, it’s strictly prohibited and may entertain severe outcomes.